This project creates a new branch library and community park for the neighbourhood of Springdale, in the City of Brampton, just outside Toronto. The building provides 1860 square metres of library program space along with a 465-square-metre multi-purpose community room. The neighbourhood park includes areas for children’s play equipment, a splash pad, parking and a contemplative garden. The four-acre greenfield site is bordered by Bramalea Road to the south, a new commercial plaza to the east, and a natural ravine to the north and west. The ravine forms part of the tributary system for the West Humber River. 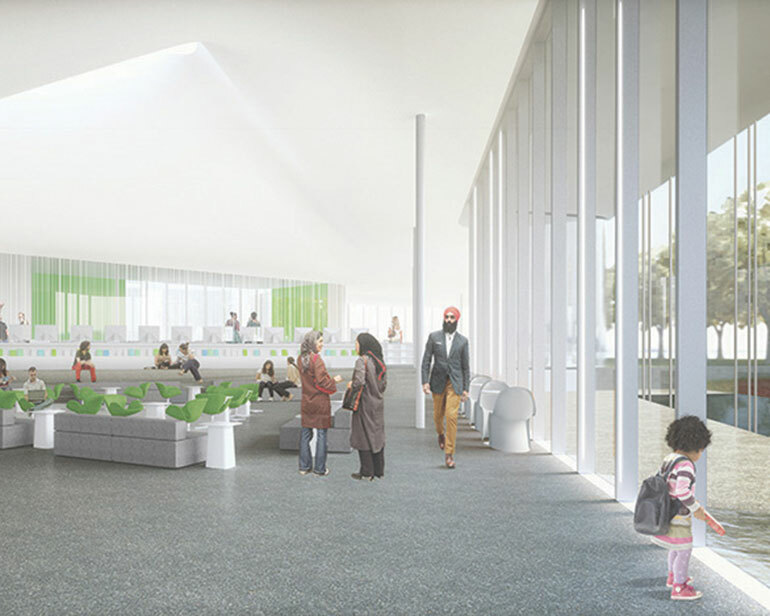 To connect the building to its landscape, the conceptual parti uses two primary devices: first, the notion of an organic, undulating perimeter joining building and courtyards; and second, the creation of an artificial topography within the flat landscape of the park, the floor slab of the interior, and the ceiling and roof planes of the library structure. Responding to the library’s request, the new facility is located as close to Bramalea Road as possible. This maximizes the library’s street presence, and forces parking to the rear of the site, adjacent to the new entry drive and commercial plaza. The remainder of the site—immediately next to the ravine—provides an ideal location for the neighbourhood park with its contemplative gardens. The building and façades work together towards two seemingly opposing strategies: they aim to be formally controlled and formally expressive. The building envelope is amorphous, undulating in and out to create entry and procession spaces from the street, parking and contemplative gardens. These undulations represent one aspect of how the building expressively relates to its natural, organic setting. On the other hand, the building footprint is controlled and contained within the overall triangular form. The negative spaces of the triangle convey a sense of order, while serving to provide canopy, lighting and screening functions, and to define three perimeter courtyard spaces. The layers of the façade are predominantly vertical and consist of the following: the undulating perimeter of glass; a striated, solar-responsive ceramic frit pattern; an aluminum framing system that supports the glazed units; a series of linear LED light fixtures integrated into the aluminum framing system; and, finally, a screen of stainless steel tubes on the exterior. This last element provides an additional layer of solar resistance, varying in density depending on solar orientation. The combination of these vertically striated elements is conceived as a functional abstraction of two combined metaphors: the trunks of trees in a forest and the turning pages of a library book. From a distance, the roof is shaped to present a hill-like profile. Inside, this area is accompanied by a topographic ceiling ascension marking the skylight over the active reading atrium. A quiet reading atrium is delineated by a minor ceiling rise, while the ceiling descends over a children’s area to create a sense of intimacy. MF: The quality of the mountain-like roof, the oculus at its centre, and the way that light will spread within the library—all of these are going to enhance the feeling of being covered and sheltered when you are inside this building. PH: The building looks to the larger site to inflect the basic move of proposing an orderly, well-planned, rectilinear box. It’s inflected in its ground plane through a notion of topography, and equally inflected in section through the raising of the green roof so that it creates a hillscape that can be seen from the street. JH: There’s recognition of the reality of what actually happens in a building: for instance, the hill is only part of the roof, and the rest is a white reflective surface. The plan also includes gardens carved into it, which create very specific zones for different types of function and program.